Home Costs > How Much Do Lockers Cost? How Much Do Lockers Cost? A locker is a small storage compartment, often in large numbers, found in public spaces such as schools and workplaces. These lockers can vary in size, purpose and security. The cost of lockers will depend on the materials it was made from, the type, the size of the locker, the features, the amount needed and the company creating them. On average, lockers can range in price anywhere from $100 to as much as $1,000. Generally, lockers will not come with just one. Instead, they will come in groups. Some tiers can include two while another can include more than 12. Standard lockers, which are usually cheaper, can cost anywhere between $500 and $800. As mentioned above, standard lockers usually come in sets of six or twelve. GlobalIndustrial.com, an online retailer that sells various types of lockers, sells kid’s lockers as well as premium lockers with six tiers. For example, a blue kid locker made from steel retails for $100 to $500. A 6-tier premium locker can cost $300 to $500. With so many types of lockers on the market, we researched some of the most popular types, along with the price you should expect to pay. Laptop Schools, government agencies and corporations use laptop lockers to secure any laptop device. $1,000 to $1,500 for a 5-12 opening locker. While most lockers will be made from a steel, it can also be constructed from a material such as plastic. As stated, groups will often be sold in “units.” Standard lockers will be sold in sets of six or 12, but the more units you purchase at once, the more you can save per locker. Construction could be the most important part affecting the costs. A fully welded locker, made up of unitized pieces could cost more than a one-piece locker created from plastic. Since lockers are considered storage compartments, the features closely resemble that of a cabinet. It will have a handle for easy opening and a lock or sets of keys for added security. Some lockers come with a combination lock that will need to be used by anyone who plans on using it. Others, such as those found in public places, may have a removable key that is released once money is inserted. Lockers used in schools usually have a simple hole where a padlock can be used if the student wants to use one. Lockers can have other features such as vents and stands. The construction would depend on what they will be used for. Inside a locker, it will usually contain a few storage racks and a pole to hang clothing with a hanger. Smaller lockers, however, will usually just have enough room to store a few pieces of clothing and shoes. 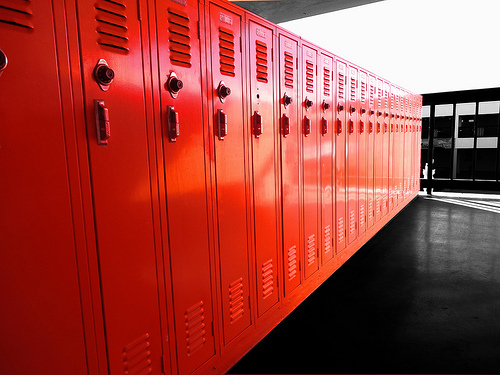 Lockers can be made from many different materials, but the most common will be metal. They can also come in many different sizes depending on the use and where they will be installed. Additional costs involved when buying lockers from an online store is the shipping and handling or delivery fee. The rate would depend on the weight of the lockers, retailer and how far it has to be shipped. If the lockers you purchase need padlocks, you may have to purchase these separately, but most of the time, it will be up to those who plan on using it to supply one. Having the lockers installed by a professional can bring up the costs as well. Depending on the complexity of the room and the number of lockers, the price of installation can greatly vary. Since all jobs are unique, consider getting multiple quotes for free from reputable contractors in your area at HomeAdvisor.com. No matter the material, they can be painted any color to match your building. If you can, consider purchasing these lockers used. This is a great way to save up to 50%. Check out eBay or Craigslist to see if any are available. Buying in bulk, especially if you were to buy more than 50 or more can bring the costs down by more than 20 percent. Some retailers, if you need to have the locker assembled before it’s shipped, can charge up to 30 percent more.